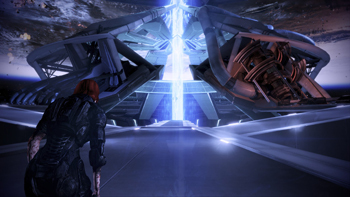 Now Wii U owners can complain about the Mass Effect 3 ending, too. The third party support for Nintendo's consoles has always been the hardware giant's weakness. At its E3 2012 press conference, NOA big boss Reggie Fils-Aime reiterated Nintendo's commitment to getting more games from third party publishers on the upcoming Wii U.
Warner Bros. took to the stage to demonstrate Wii-specific features in the upcoming Wii U release of Batman: Arkham City, including a motion-controlled Batarang. They also revealed a new Scribblenauts, that allowed players to create their own items and objects to use in-game - such as an "Auto Mutt," a dog with car wheels. Nintendo also showed a quick demo reel of other high-profile third party games for the Wii U. We caught glimpses of Darksiders 2, Alien: Colonial Marines, and Ninja Gaiden 3, among others. Tekken Tag Tournament 2 bizarrely showed off some traditional Nintendo powerups like the super mushroom. The big surprise, of course, was Mass Effect 3. Shepard can finish the fight against the Reapers on the Wii U, too. One can't help but wonder how they'll handle the decisions made in Mass Effect 1 and Mass Effect 2.